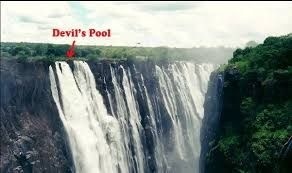 The Vitoria Falls in the Zambia is home to the most dangerous pool in the world. 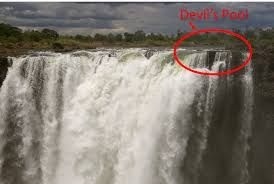 The naturally formed Devils Pool, near the edge of the falls on Livingstone Island on the Zambian side. 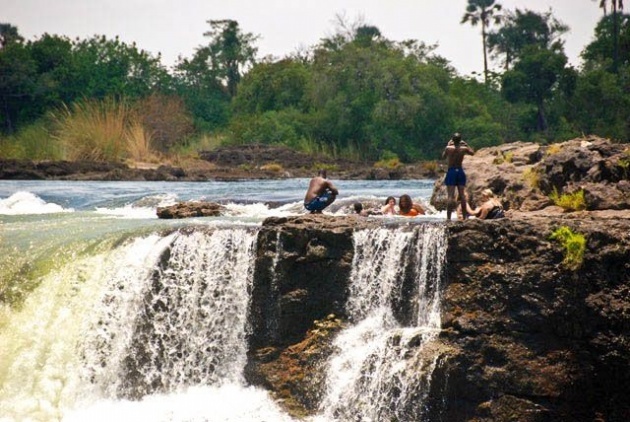 When the river flow is at a certain level, usually between September and December, a rock barrier forms an eddy with minimal current , allowing adventurous swimmers to splash around in relative safety a few feet from the point where the water cascades over the falls. Be warned, occasional deaths have been reported when people have slipped over the rock barrier. 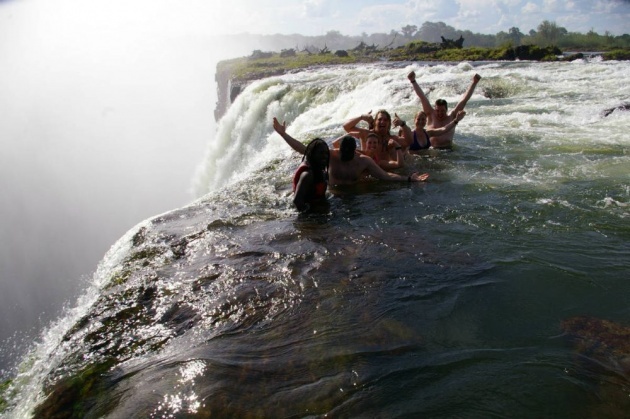 These falls are becoming well known amongst the "radical tourist" industry , when more and more people search for the ultimate experience. It is a protected area, that is only allowed a maximum of 16 people on at any one time.The utmost care is taken to protect and preserve the natural habitat of the area. 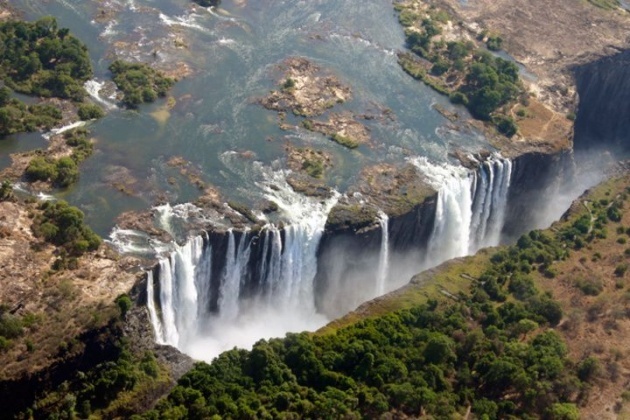 Tongabezi have an exclusive operators license to conduct the Livingstone Island and Devils swimming pool tours. Only a slippery, submerged lip of rock stands between these batters and a 100m. 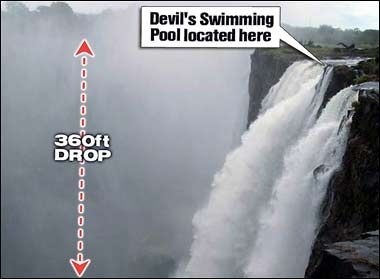 drop over the worlds largest waterfall. Very adventurous tour , but very safe.All guides take very good safety precautions. 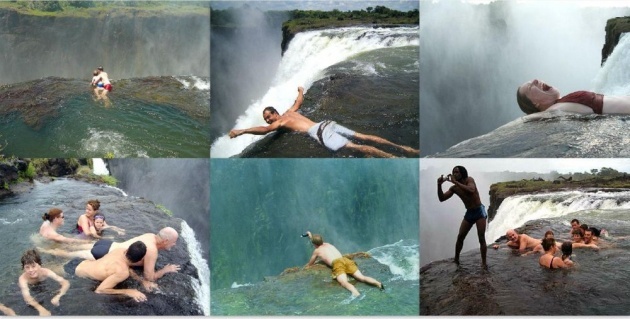 If you're lucky enough to be at the falls during the time you can swim in the falls, don't miss out on this experience, it is amazing!! It's not for the faint hearted and you should definitely be a confident swimmer, but not necessarily a strong one. There are some currents but as long as you listen to the instructions and are confident you will be fine. You get taken over to the falls by an experienced guide, and a photographer will take your phone/ camera from you to take pictures, and the photographer is amazing! 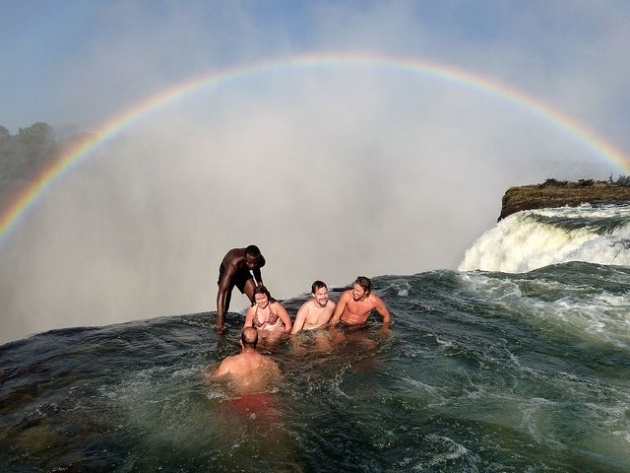 He took photos over the falls, panoramic pictures of the rainbow over the fails and loads of pictures of us all swimming in Devils pool. I was stunned when I got back my camera and it contained loads of amazing pictures. Although you have a time slot we didn't feel rushed at all. We picked breakfast to go over, and I would recommend the latest breakfast slot as you get the sunshine! But if you're pushed for time take an earlier slot and it frees up the majority of your day. The breakfast was so much better than we had anticipated, and it's serves on Livingstone island itself. You basically have breakfast overlooking the falls. It's an expensive activity but you get a lot for the cost, they truly make it an experience to remember! I would highly recommend this experience. 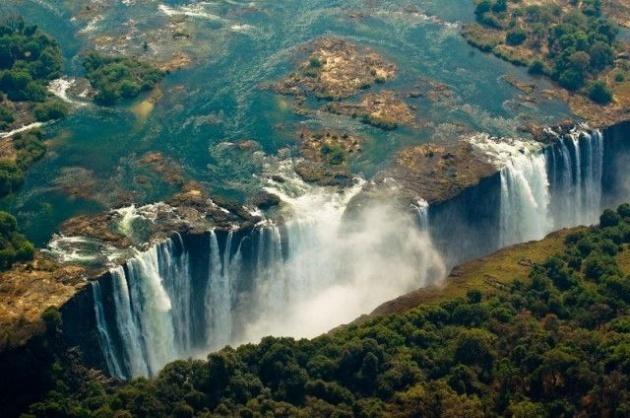 You can only book the tour by livingstone hotel, but you can buy the package through any hotel in town. 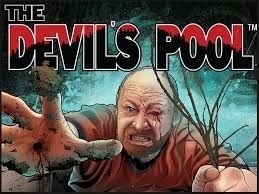 Hope you enjoy it, thank you all! Swimming is essential. Everybody should learn it. In here, kids learn it at school. However, most kids already know it when the join preschool. This is really a great place to swim! I like to visit this place soon. Nice, exciting and thrilling experience . . 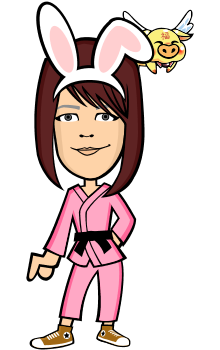 Thanks @xodium-chloride !i wish you all the best!